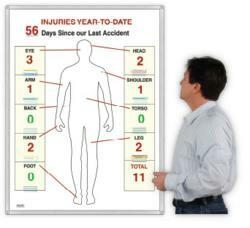 Safety managers find displaying the injury points on magnetic body-diagram is a powerful motivator. “Our customers tell us our new HurtSpot board works because their employees relate to the human form,” says Magnatag spokesman Christian Krapf. For more information about Magnatag HurtSpot safety whiteboard systems go to http://www.magnatag.com/hurt or call 800 624 4154 and talk to a visible systems specialist.